In this post: Have you ever wondered how to sew like a pro? Get my top sewing tips that anyone can use when sewing home decor or personal items. I believe that everyone, no matter what, has some sort of story. My story begins when I was about twelve years old. My mom enrolled me in sewing lessons at our local Singer store. That summer, I spent many happy hours in the back of that store leaning over a sewing machine. I went back for several years until I was old enough to get a summer job. I learned how to sew everything. I made dresses, pants, skirts, and even a snazzy plaid blazer. Fast forward a few years. I am now a wife, mother, and homeowner. I picked up sewing where I had left off, but now I was making curtains, Halloween costumes, and doll clothes. As my children grew, and I had a little more extra time, I designed a line of girls jumpers. I peddled the jumpers at local shops and an occasional craft show. I made absolutely no money and, after a few years, I took a job at my children’s school as the office secretary. During the years I worked at the school, my life was full. I had a job, two very active kids, a husband, and a house that needed work. My sewing skills were again resurrected to make curtains, pillows, and bedding. I covered old cushions and chair seats. I was always working on something. Back then, I didn’t really consider myself a creative person. I knew what I liked and had a limited budget. As a result, I had to figure out ways to get the look I saw in magazines on my own. I know now that this is what creativity is all about. Fast forward again to eight years ago when this blog began. About the same time, I opened an Etsy shop and sold handmade home decor items. I had to gather everything I had learned in the past to make this shop a success. I loved every minute of owning that shop until it closed in March of 2016. In this post, I am sharing my best sewing tips and tricks from a lifetime spent sitting at a sewing machine. One of my pet peeves in life is loose or hanging threads on ANYTHING, but especially on soft home furnishings. (I have a thing about tags too. They get cut off right away!) Clipping threads will give any project a clean and professional look. To take the items I was making up a notch, I knew that my interior seams needed to be finished with a serger. My dad and my husband bought me one the first Christmas after I opened my Etsy shop. I have to admit now that I’m spoiled and will probably never make anything again without serging the seams. 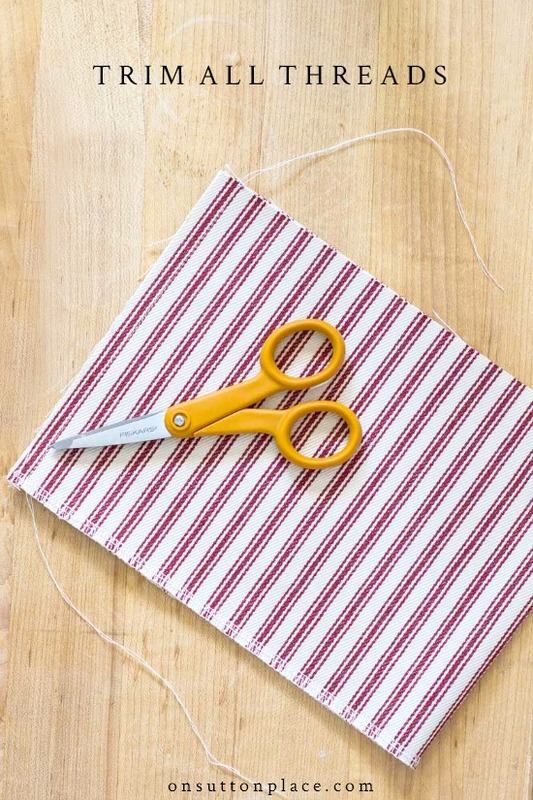 BUT…if you are sewing for yourself, pinking shears or a simple zig-zag stitch will finish your seams perfectly. *Note: all my favorite sewing tools will be linked at the end. How to finish pillow corners is for the most part a matter of taste. Designers and decorators sometimes round the corners. Personally, I like a crisp, pointed corner. To get the job done you need a tool called a point turner. 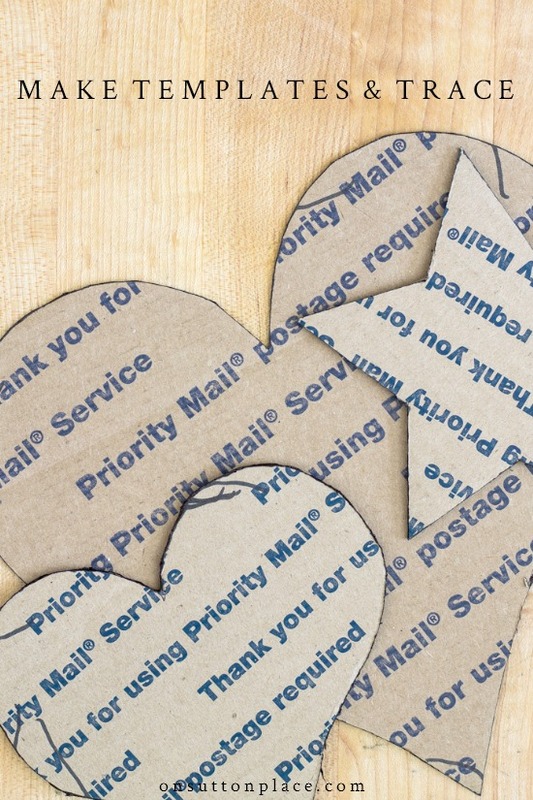 Don’t use the tip of your scissors or a letter opener! Anything metal could slice right through your fabric. One of my best sewing tips is no matter what you are sewing, if there are corners, use a point turner. All fabric purchased off the bolt, even 100% cotton and linen, has a stiffness to it before it is washed. Sometimes, this stiff finish makes it difficult to iron out wrinkles. I hate wrinkles in fabric when I’m trying to sew. 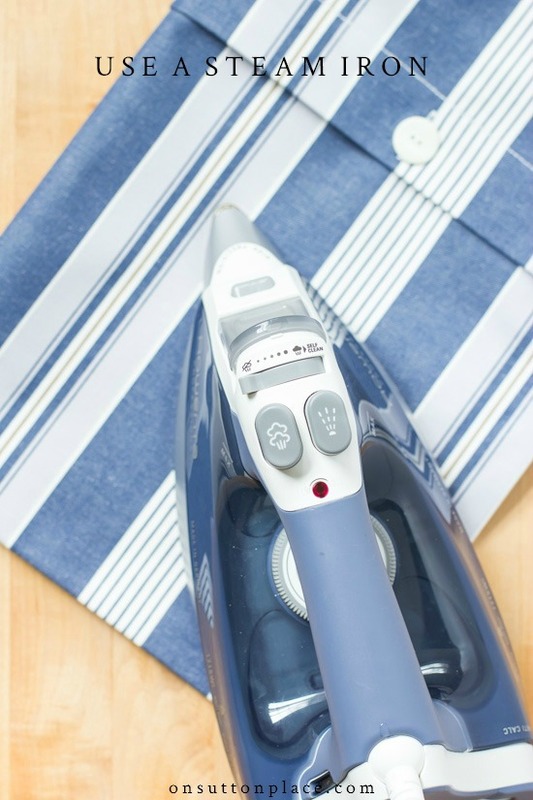 Washing your fabric before you begin to work with it eliminates this stiffness and makes it so much easier to iron. Plus, if there is any shrinkage, it happens before you sew your project and not after. One thing though…please don’t wash 54 inch decorator fabric. Most is dry clean only and some of it has a soil resistant finish. 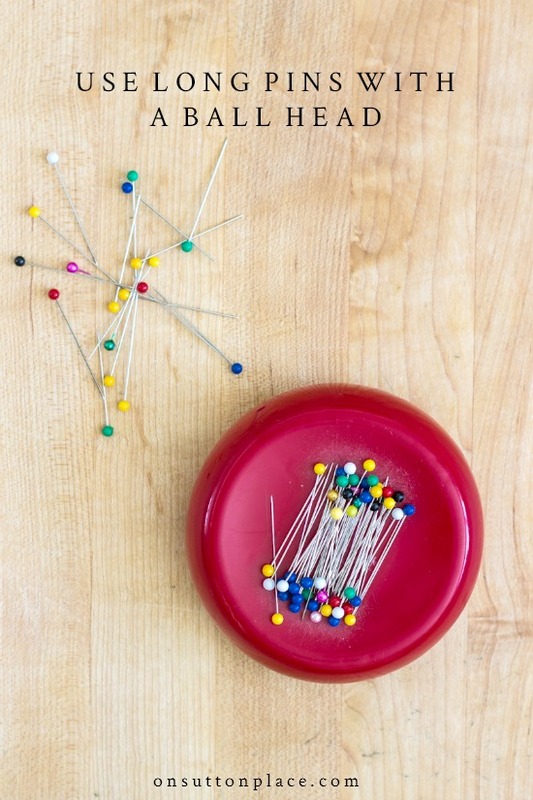 If I had to pick my top three can’t-do-without sewing tools, one of them would be straight pins. Straight pins have come a long way since I was a girl learning to sew. They used to be tiny, maybe an inch long, with really no head to speak of. My favorite pins now are long, at least 2 inches, with colorful ball heads. Easy to see, easy to use, and long enough to go through just about anything! I also highly recommend a magnetic pin holder. Mine is called a Grabbit and I’ve had it so long it’s like an extension of my right hand when I’m sewing. I could not live without it! Sometimes using a pattern piece, pinning and then cutting, is very time-consuming. I have found that actually making a template, tracing, and then cutting is so much easier and quicker as well. I make a template for every pattern piece I use out of old cardboard boxes. I lay the template on the fabric, trace, cut and am finished in the time it would have taken me to just pin the pattern piece. I have several sizes of square templates for my pillow covers. I also made templates for the Christmas stockings I designed for my Etsy shop. I’m a believer in time-savers and this one is huge. Included in that top three can’t-do-without sewing tools is, of course, scissors. My advice is to always have two pair. A large pair for cutting fabric and a small pair for cutting threads. I buy Fiskars and would never buy anything else. I get them at JoAnn fabric when they are on sale or I have a coupon…or sometimes both! Sharpening scissors is really a thing of the past. My sewing machine shop will do it but they actually send the scissors away. When my scissors wear out, and it doesn’t happen very often, I simply replace them. If you’re wondering what number three is in that top three can’t-do-without list, it’s thread. Good thread. My all time favorite thread is Gutermann. Way back when I began actually selling what I made, I stopped buying the inexpensive thread. It just wasn’t worth the hassle of broken thread in my machine. Or knots. Or annoying fuzz. 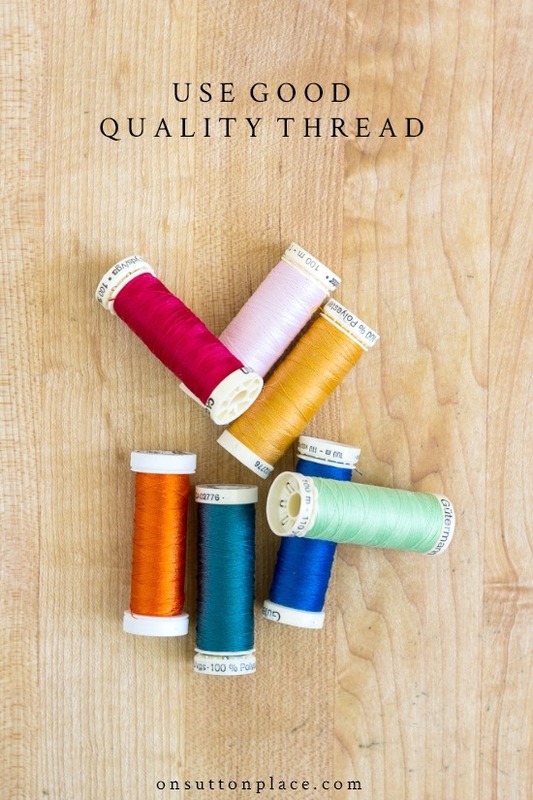 Not only is Gutermann thread easier on your machine, it’s much easier on your temper! Needles wear out, so change them on a regular basis! They don’t have to break to be bad. I admit that I am not very good at this one. I am guilty of waiting until a needle breaks to install a new one. When your machine is running well, and that includes having a good needle, everything is easier. NEVER use your fabric scissors on paper. 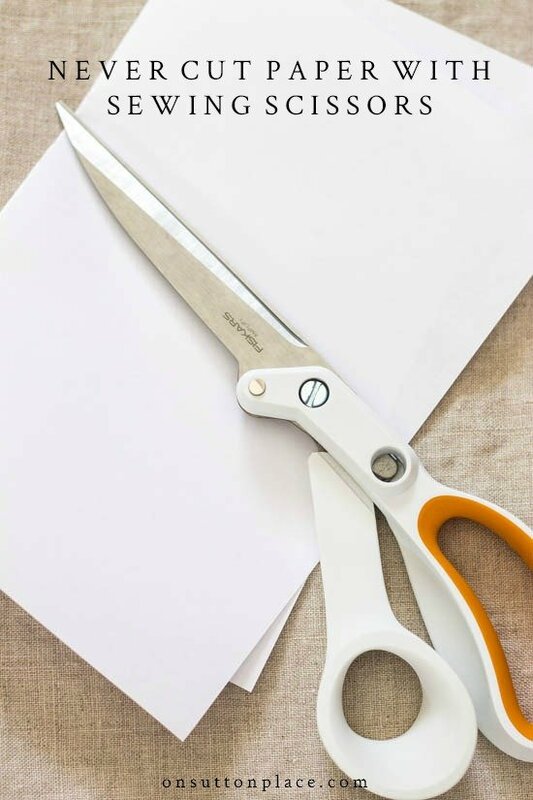 There is no quicker way to dull your scissors than to cut paper with them. As tempting as it is sometimes, just don’t do it. When it comes to sewing tips, this is perhaps the most important. In my opinion, based on years (more than I’d like to admit) of experience, pressing as you sew is what gives your piece a professional look. When you sew a seam, press it. Use a hot steam iron and press after each step. Not only will the end result be SO much better, the steps will be easier as well. 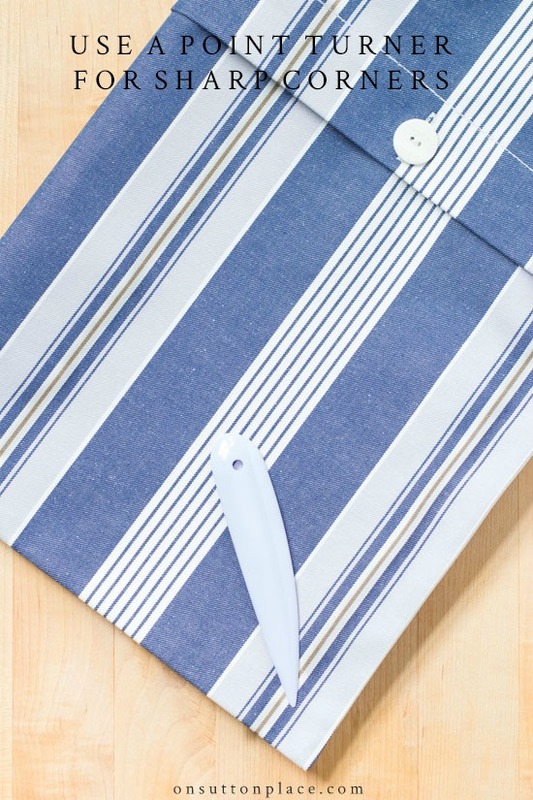 You will save time and energy if you work with neatly pressed pieces of fabric. Here’s the best part…the feeling of accomplishment is amazing when you finish that last pressing and your project is ready to use. That moment for me is pure fun and no matter how many projects I have completed, it just keeps getting better. « How to Sell on Etsy: Open an Etsy Shop! Thanks for the pointers, I recently opened a Etsy Shop!! I have a question for you, when you make a cardboard pattern and you trace around it on your fabric and then cut it out, what did you use to trace onto the fabric with? I am not sure if I use a specialty fabric marker that washes away, or what to use. I would appreciate you sharing what you used. I would LOVE to have you check out my Etsy Shop and let me know your thoughts about how it looks. My link is http://www.etsy.com/shop/MarysStitchNiche. Any help or advice about my shop would be SOOO appreciated. Oh I love your blog by the way!! I sent you an email Mary! I love your sewing posts! Based on your earlier recommendations, I bought Fiskar scissors, a point turner, and threw out ALL of my small pins to be replaced by long pins. It’s amazing how little things make SUCH a huge difference! When I was young (11 or 12) my mother taught her best friend’s daughter how to swim. And her best friend taught me how to sew. I made most of my own clothes in high school and college, even my senior Prom dress! I got my first Kenmore when I was 13 or 14, and I loved it. It was a table version, and I only let it go because I don’t have room for it. I have another Kenmore and I am happy with it; I just need to develop that relationship a bit more. NEW THINGS I LEARNED!!! Cardboard templates – I sew mostly pillows now; having a template for each of my different sized pillows will save me hours! (This is a priority!) Guterman thread – I already had a nasty run-in with rayon thread. That won’t happen again. Changing the needle – I have never done this; actually never heard of it. Definitely will do it though!! I have your banner post saved–I have not used it yet but someday I will! Thank you for helping so much with something so many of us love !! I am learning how to sew at the moment. I like your point about trimming all threads. I’ll keep this in mind so it looks clean and professional. I loved reading this, Ann. I learned to sew while in 4-H and my mother learned along with me! I even went to the Ohio State Fair with one of my outfits! I was so grateful to learn from some expert seamstresses who loved sharing their love for fabric and details. To this day, I still look at the inside of an outfit and shake my head at threads hanging and just the messiness of it. I will pass on anything with unmatched stripes and plaids. Old habits die hard. I just had to replace my iron and again invested in a heavy duty Rowenta steam iron. If I am going to iron, and i am, I will use the best I can afford. Thank you for your posts. I love reading them, I feel like we could friends!! This is such good information, Ann. Thanks! What an awesome post, Ann – everything you make is so perfect! I never even HEARD of a corner turner – ty for the links too. I may have to step up my game now that I have been shown a better way to do things! 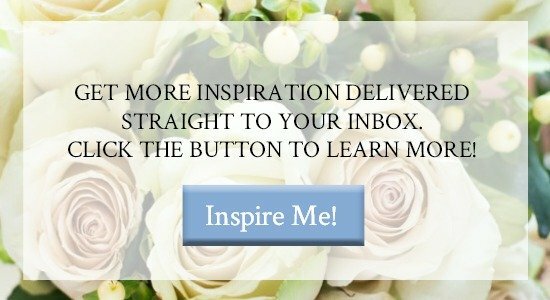 Ann, this particular blog really hit home with me. I learned so much about myself through sewing. I saw how tenacious I could be. How much patience I could muster to finish something. That I was creative and determined and resourceful. I was never that good at making clothes though. It was once I got married, and had my kids that I put this skill to work. A funny story…. I was determined to make my granddaughter a stuffed dragon from material she picked. It had to have wings, a long tail, horns, and ruffles down the back. I worked for months on that darn dragon, designing it, making a pattern ( well, sort of) and sewing it together. You would be amazed how good you get at covering up mistakes. Long story short, I had two bags in the car, one for the Goodwill and the one with the dragon. You can guess what happened. I hope some sweet child out there is enjoying my creation, cause my granddaughter never even got to hold her dragon once. And no, I didn’t take a picture of it. Oh life, how sweet thou art! Thanks for the tips Ann. Some I didn’t know, like using the Gutermann thread. My mother taught me to sew when I was young, really young. I lost. Interest as kids tend to do but picked it back up later in life. I’m not great at it and haven’t sewn in ages, I recently bought myself an industrial one for crafting, but have yet to use it. Last things I sewed were those tea stained muslin rabbits with the really long ears that were so popular back in the 80s. I even made dresses for them and gave them all to my ex husbands nieces. Thanks for reminding me how FUN sewing can be! Have a good week! 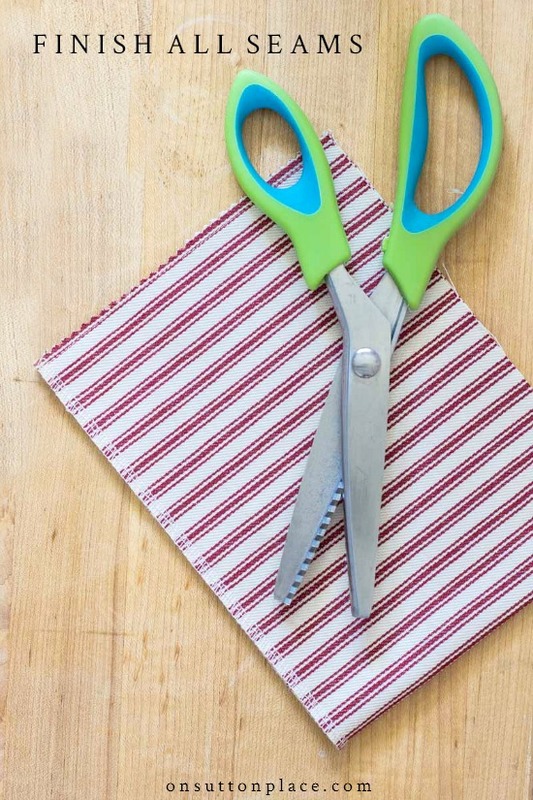 Thank you Ann for all your tips…I have been sewing for many years as well and I never knew not to cut paper with my sewing scissors..so that is the reason why I keep on buying new scissors. See you learn something new every day. Loved your tips and stories, brought back memories of learning to sew from my mom. When I told her I wanted to learn to sew, she told me I had to learn to iron first! She had me ironing my dad’s hankies and dress shirts. I learned to sew on her Singer Featherweight and am happy to still have that machine. although I mostly sew on my Kenmore machine that was the first thing I bought when I graduated from college and started working . My sewing now is mostly for charity, specifically for Sew Powerful. Thank you for these detailed ways to improve our sewing. I appreciate the advice on thread the most. You are a great teacher and I can picture you doing these things all the time. Hi Ann! I’m a sewer as well! Right now I’m working on summer dresses for my granddaughter! So much fun! But……I hate cutting out the Patterns! Oh well, you can’t do one without the other! Happy winter! Oh how you brought back memories (many years past). When I was in high school, we had “Home Economics”. I was sewing a skirt (which I didn’t fit in to when it was finally done). I sewed up my thumb on the machine. It went completely thru the thumb. The teacher ran down to get the male art teacher, and he about fainted when he saw my finger. Alas, this hasn’t made me afraid. I am still sewing today (60+ years old). I am not a fancy sewer, but do manage to make curtains and do mending. It is so rewarding to make something homemade for my home. Thank you for your wonderful blog. I loved reading this post! I was stunned to learn that you sew and I enjoyed reading your story about it. Since I began to sew again over the past five years it’s been a journey of joy. So very much is available to all of us now who want to learn and create, and that’s certainly true in the world of sewing! You Tube has been an extremely valuable resource for me to find tutorials and wonderful instructors. Anyway, happy sewing, Ann…..
Ann, this is another beautiful blog post! I too learned to sew at about 8-10 years old. My mother taught me and then as a young mother I took sewing classes and perfected my skills and learned new ones (Pattern making and smocking!) Now I am teaching my 10 year old granddaughter to sew and oh what a good time we are having! She’s doing very well and asks what are we making next! I try to keep it interesting and remember that her attention span is not as long as mine. I want her to love it and enjoy it. I bet you will sitting your granddaughter on your lap to “help” before you know it! Your list of tools is a great one and I am needing a new iron. Have been looking at Rowenta and seeing that is what you use assures it would be a good choice. Thanks again! It was like I created the list myself! I couldn’t agree more with everything you’ve listed. I’d also add a marking tool to the list. A soapstone marker comes in white and grey and makes highly visible marks on fabric when it is sharp. I also have a Japanese plastic crease maker that does a fantastic job of marking lines. Thanks very much for the tip on changing the needle often. I never knew that, as you said, I only changed it when it broke! I might add to have your sewing machine serviced regularly, especially if you use it often. I also agree about only using cloth scissors on cloth and having two sizes of scissors. I guard my scissors now and even write cloth on them! Loved reading your post about sewing. I haven’t sewn for a while and I miss it. We moved and I haven’t even unpacked my sewing machine. I haven’t gotten to the box. I wanted to learn to sew when I was 9 and my mom said I could if I would let her friend help me. I made a dress and wore it proudly. That was the beginning of my love for sewing. I made most of my clothes in high school and a lot of clothes and other things for my kids and other members of my family. I loved it! It’s a great thing to learn. Thanks for sharing your story. I too have been sewing for years and it has skipped a generation but my granddaughter asked for a sewing machine for Xmas (she is 6 1/2) and has asked for Nana to teach her to sew. First project was a little purse and I was amazed at how straight her sewing was (way better than her mom ever did). I am anticipating many enjoyable years to come with teaching her to sew. As someone who’s been sewing forever, I’d have to say my padded and gridded worktanle is my must important tool. Crawling on the floor is horrible. Also, I use a plexiglass template for pillows. You can see the pattern and line it up accordingly. The sign of a true pro, even if a home sewist, is an improperly matched or aligned pattern, especially on home decor. I prefer Wolf scissors which get a regular sharpening. The difference is night and day. Lol, love your three things you can’t do without. I, unsurprisingly, have the exact same three things as my top sewing aides. I splurged about ten years ago and bought a lovely pair of Gingher scissors for fabric and a tiny pair for threads. They cut through absolutely anything like butter (though not paper, of course). I bought a pair that will handle heavy fabric as I love sewing with denim or upholstery fabric so I think I will get the next size down this year for lighter shirt weights. 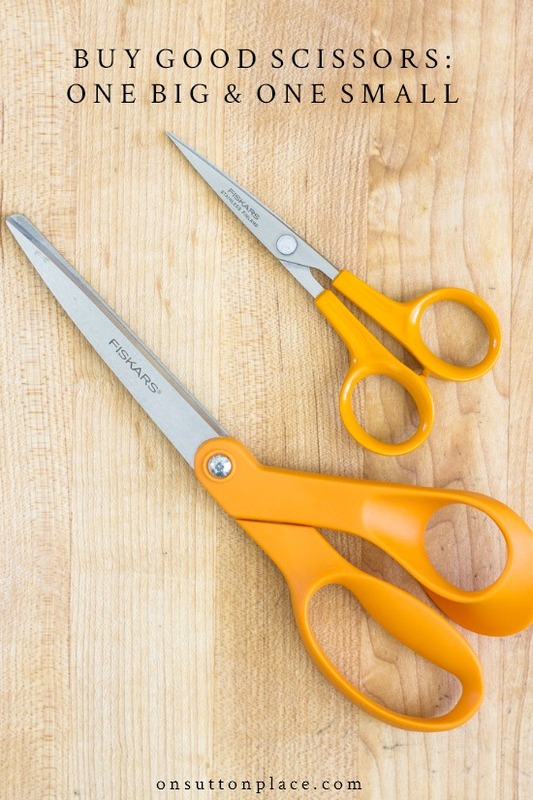 Used to threaten to beat my children severely if they used my fabric scissors for paper, and I kept tons of cheap ones around to prevent that from happening, or my being tempted to use them for that in a pinch! I learned to sew on my mom’s old black Singer portable, but love using a more modern machine that does zig-zag and other stitches now. Would you believe she’s still using that machine? I think it’s getting close to being a hundred years old now. I even sewed my fingers down a few times. Grace is not my middle name. All good advice! Do you have a favorite brand of sewing machine? I’m hoping to get a serger this year! 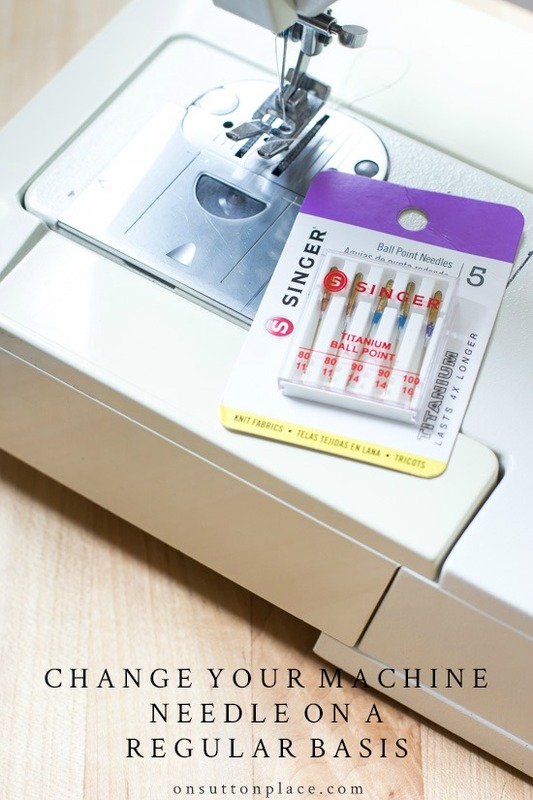 Schmetz sewing machine needles are available in bulk on Amazon. I buy a box of 100 . The initial outlay is big but the price per needle is a fraction of what you pay when buying a 5-pack, even on sale. Using a new needle makes a world of difference! Hi, Ann. My mother was a home economics teacher so I learned to sew from her. Everything had to be done the “correct” way. She wouldn’t even allow me to have a seam ripper in my kit. Stitches had to be removed carefully so as not to rip the fabric. Like you, I sewed from necessity and then when my children were small, I learned to smock. My grandmothers on both sides taught me to embroider and that was a skill that helped with the smocking. I hope to have more time to sew and smock and embroider again one day when I “retire.” Thanks for bringing back good memories of days spent with my grandmothers and my mom learning these skills. This is one of the most enjoyable and useful articles I’ve read in a long time!!!! Thank you for writing this! I love to sew and I was worried it was a lost art. Like you, I’ve been sewing all my life. I would love to know where you get your ticking fabric? When I was little the PTA at our elementary school had a fashion show every year where the kids modeled the clothes made by their Mom’s. I made a dress and modeled my first creation in the sixth grade, I can still remember how proud I felt. My Mom taught me to sew, I remember one day wanting to sew and she said she didn’t have time. I said, but I’m the one sewing, but later realized she didn’t have time for my million questions. I’ve been sewing over 50 years and I still love it, I agree with everything you said in this post. I, too, learned to sew as a child. I was in sixth grade when I announced to my mother that I wanted to learn to sew. Since there was no place to go to learn, it was up to her to teach me. I can still see the semi panicked look on her face as, sewing was not her strong suit. The only thing I remember her sewing is drapes, and I became her partner. I did all the fabric pattern matching and cutting while she sewed. She couldn’t bring herself to make the first cut into expensive drapery fabric. You have dredged up good memories along with your good tips. It’s just so hard to find an iron that gets hot enough to do a good pressing job when sewing. I too have been sewing since I was a child and have passed that on to my daughter who is on Etsy and has a small business sewing baby and mommy items. Oh I took Singer Sewing classes, too! I think it was 8th or 9th grade! wow–memories…>AND it all came back to me years later (like 30!) when I got married and inherited a machine…LOVE home sewing and I use corsage pins for my pinning, similar to what you use….GREAT TIPS refresher!!!! Your story sounds so much like mine! I learned to sew while very young and have never stopped! I am 6 feet tall and nothing was ever long enough so that was one motivator but I enjoyed it and made everything I wore except jeans and sweaters from high school on. My love of sewing really increased when I started sewing quilts. I ended up working a few evenings at a local quilt shop when our girls were very young and eventually bought into the business and it grew to a large shop and we wrote and published quilt books! You just never know where a sewing machine will take you. While we are retired and closed our shop after 30 years we still hold quilt retreats 3 times a year. A great group of women have been coming to these for about 10 years and we all gather at a hotel and use the banquet room to sew, laugh, catch up with each other, eat great food and create whatever we feel like. That happens this weekend and I am so looking forward to 3 days of sewing ! Thanks for sharing your sewing story, it is rather amazing where one machine can take us. Oh Ann, you speak to my heart. I also have gone through stages of sewing and am ever so grateful I learned to sew. I am neither a quilter (too much math) nor a dressmaker (too involved) but I love to do lots of other things. 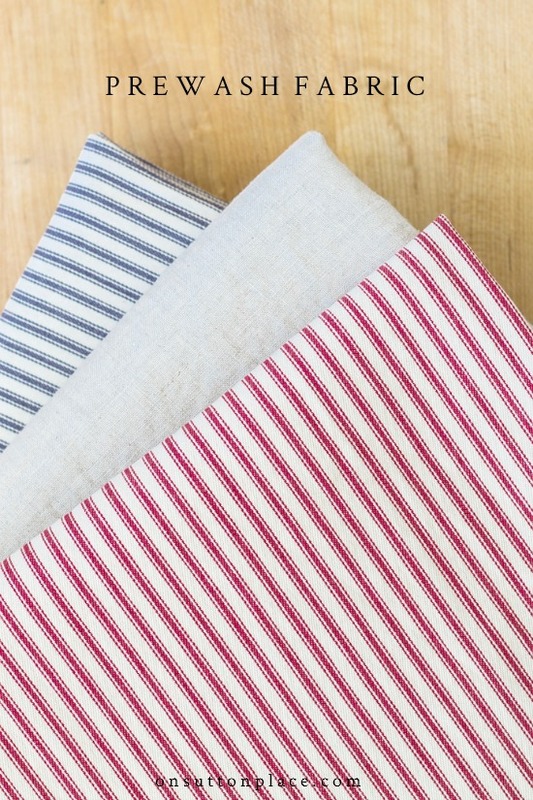 Right now the store bought tea towels are on the sewing table to make new curtains for the laundry room and to hide a shelf. Your tips are exactly what I do and believe in for ease and success. It is a “no school” day here because of the ice and since I am now a retired teacher I can enjoy not having to spend the day catching up on the never ending lesson plans etc and will be at the machine! My sewing experience took a similar route. The only difference is that I started making Barbie clothes at age 10 on a little Singer chain stitching machine. My mother was my instructor. I did take some “home ec” in school and a couple organized classes.when young. All of your tips are exactly what I do consistently. Your decades of sewing follow my path exactly. I was known as the best Halloween costume maker around. People couldn’t wait to get my hand-me-downs. I have made too many curtains to count. It is comforting to know that there are other slightly OCD home sewers out there. Thanks for the list! I love reading other’s thought processes and tips. Have never heard of a corner tool. My mom used the eraser end of an unsharpened pencil. I use a pointed but blunt letter opener that belonged to my grandparents. Creative people find things to create to fill a need such as you have been doing for years! I have been sewing since I was a child also. But you taught me something new. I have never heard of a point turner until today. I will be buying one before my next sewing project. On Sutton Place is the first blog I found! It is so practical and helped me discover and try new things. I also started sewing in my teens. Your sewing tips are great! Your Etsy shop is the first shop I found. I found it through your blog. We have used the clay tags at ornaments and I keep the dove out all year! It hangs from the knobs on my china cabinet! Your packaging is very special it made my purchase arrive like a gift! I never change my needles unless they have broken so that is good to know. Thank you for the tips- I pinned this! I’m getting back to sewing after not doing much for many years. I used to make a-line dresses with matching drawstring purses that I wore to elementary school. Such fun. Now I want to make pillow covers and maybe some cute things for my granddaughters. I’m curious about what kind of sewing machine you use? I’m glad I have all of the above and use them when I sew!!! Now close to retirement, I hope to start sewing again. Thanks for the recommendations and grareful for the review! Good job!!! I agree on all the above!!! I took Singer sewing lessons too, the summer after 5th and 6th grades. I actually won second place in the Midwest competition! The prize was a was a singer 201 featherweight, portable machine. I still have it and I am 74 years old! Good morning Ann. I love sewing stories. In my generation it was expected that young girls learn to sew. I started at age 9 on a 100 year old treadle sewing machine with a white sheet off my mothers clothes line and red thread, that was all I had. I was so proud of my shorts and crop top I made to wear to a family reunion full of women who were expert seamstresses. My mother, no. She was not so happy about the sheet either! Since then through school, college, early marriage, career and now retirement I sew for many reasons. One item that I discovered as an essential are the Magnetic Stainless Steel Bowls from Harbor Freight, small and/or large. *inexpensive, 3.99 and 5.99. In my studio these are indispensable. As a quilter the fabric can be large and cumbersome while loading the long arm, I like to pin placement/registration areas and then I can drop the pins right into a little planter bucket with one of those bowls in the bottom, pins land correctly every time! Thanks for sharing! In your opinion what would be a good start project for begin sewing? Thank you for the great tips, Ann! I always look forward to your tips and messages. I, too, have been down several paths with my sewing and now am trying to quilt. Ann, your story is my story! I have been sewing since around age 13 but learned everything from my mother. No sewing classes but I made everything from sleepers to bras, slipcovers, draperies, etc. I too, tried to make money sewing but have never been able to. Now I’m content to sew for myself, my house & my grandchildren. I have everything but the grabbit and pinking shears. pinking shears lost way back yonder! lol I agree with every tip. And I’ll purchase pinking shears and grabbit next time I’m in hobby lobby or Joann’s. Thanks you! The link for the long pins goes to the Dritz point turner. Can you provide us with a link for the long pins. I have trouble finding good ones where the head doesn’t come off. Great tips! I have been sewing for myself and I have done some professional sewing as well for about 50 years! (Whew, did I just admit that?) I agree with all your tips, especially the thread clipping and the pressing. Although the clipping is not crucial to everyone, (it is to me of course), but the pressing as you go definitely is! Great work, Ann! French seams were great on pillowcases! Thanks for your lovely post. I love having these visuals when I teach my children (visual learners) to sew. I have, myself, been sewing since I was about 5, though I didn’t start finishing seams properly until about 9 years later… No one taught me, you see. I had to learn it on my own from books and such. What you do is soooo valuable! These are all great tips Ann. I remember when I was learning to sew, my mother teaching me to press everything really well. The unfortunate thing about being a sewer is that it’s hard to buy inexpensive clothes. I always look at the seams and finishes and tend to have to pay more to get good quality. Great tips, Ann! Thanks so much! Short stitches are a must on pieces that receive a lot of use. Longer stitches would pop and all that. Those are the same tips my mom gave me when she taught me the basics of sewing. Reading this bought back some really great memories, thanks Ann. Thanks for the professional tips Ann, I felt like you were talking directly to me with the ironing one~I am so bad about that, plus I am a terrible ironer, I must improve! I promise I’ll try!! Thanks for the tips. Good advice, indeed. I’d never seen the corner tool. I did read somewhere the suggestion to use a fish knife (I think the blogger suggested she finally found a good use for it). I went to the thrift shop and bought what is probably a butter knife, but it has a pretty good point to it. I can see the Dritz tool had a really sharp point and the perfect angle. 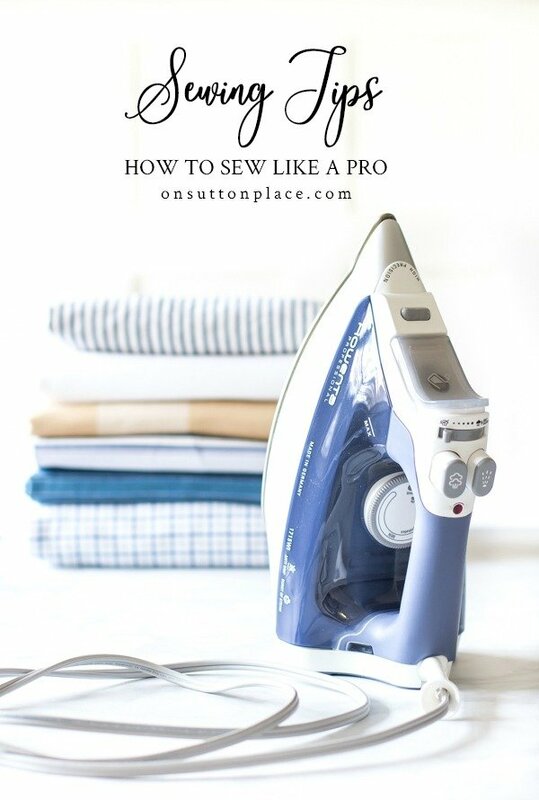 Great tips and I agree with every one of them- just wish I had the serger though. I too love sewing decorative items now even though I sewed all my clothes in my high school and years even into college. But don’t make clothes anymore. I can remember seeing an outfit in the store and saying, I could make that so much cheaper! Those were the days! But from watching the show “Sewing With Nancy”, she convinced me of using a press cloth when needed and something called directional sewing when sewing long seems on the same piece of fabric. In other words, sew from top to bottom on all seams when piecing, such as with a bedspread, window treatments, etc. Also press the seam flat to set the stitches and then open to press the seams open. Love you decorative sewing. I would love a serger! What brand do you use and do you like it? Love your tips Ann! Even though I don’t sew, I can appreciate your professionalism! My mother sewed almost all my clothes when I was young, and I do remember her pressing her seams. I was totally unaware of that corner turner, though! Wow! I just pinned your tips and 4 people have already repinned! Enjoy that beautiful weather! GREAT tips Ann, thanks for sharing! I’ve pinned this!!! Your tips are right on the money, Ann, after sewing for clothing for several years I have found all of your tips to be absolutely imperative for a nice professional finish. I zig-zag my seams but I’d love to have a Serger, perhaps I’ll get one for Christmas this year. I’ve not been around much this summer, I’m with my grands five days a week and that severely cuts into free time. I’m thoroughly enjoying it though! I love your products – as you know from my orders. However, I have tried my hand at making pillow covers of late. I need more practice on inserting a zipper. :-/. Thanks for the helpful tips. I always look forward to and enjoy a post from you. Been a little unseasonably cool in TN as well, but I think summer days are expected to return this week. You do a beautiful job always. I just turned 60 (yowza!) and have been sewing most of my life. I’ve never heard of a Point Turner, but I’m going to get one now! Your top five are my top five, for sure. Thanks for sharing, all the time. I really enjoy your blog. Fantastic tips, Anne! I’m fussy about threads and such too, except I’ve never heard of a Point Turner. Thank you so much for make things a bit easier. I will be adding one to my stash. Your pieces always look so pristine and well-made. You are an excellent seamstress. As a professional seamstress for over 30 years I can add one more tip to your list……..press each and ever step of the way. The best way is to press seams flat then press them open. Taking the little bit of time to do this gives amazingly perfect results.